Deepening interdependence, due in part to the success of the postwar order, has contributed to an anti-global backlash across the world. Beyond Gridlock, (Polity Press, 2017) seeks pathways of change through the gridlock. 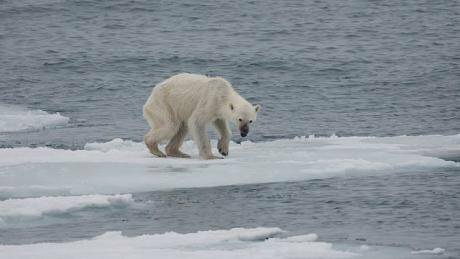 Endangered arctic - starving polar bear, 2015. Andreas Weith/ Wikicommons. Some rights reserved.Can we manage the globalized world we have created? Every day seems to bring new evidence to the contrary. From the wars in the Middle East, to nuclear tensions in East Asia, to an ongoing migration crisis, to the looming threats of pandemics and financial shocks, to the growing danger of climate change, our ability to meet global challenges is falling short. In our 2013 book Gridlock, written with Kevin Young, we argued that these instances of multilateral breakdown were not just a string of bad news, but products of the same historical process. The “success” of the postwar order in building a managed form of globalization allowed interdependence to deepen. New countries joined the global economy, companies expanded multinationally, and once distant people and places found themselves increasingly – and, on average, beneficially – intertwined. But the virtuous cycle between deepening interdependence and expanding global governance could not last because it set in motion trends (see Box 1) that ultimately undermined its effectiveness. Increasing multipolarity reflected the success of bringing millions out of poverty, but also increased the number and diversity of voices that had to agree on global issues. Deepening interdependence brought many benefits, but also generated harder, more complex problems, “intermestic” issues that penetrate deep into domestic affairs. As international organizations expanded to address these new challenges, many found themselves locked into sub-optimal policies and decision-making rules that could not adapt to changing circumstances. And this institutional inertia in turn has led to a proliferation of new institutions and organizations, fragmenting many areas of world politics into a confusion of overlapping jurisdictions and redundancies. The result is gridlock. Since we wrote Gridlock, the problem has probably worsened. Most dramatically, there has been a sharp rise in nationalism and populism around the world. From Trump’s America to Brexit Britain, from Modi’s India to Xi’s China, from Erdogan’s Turkey to Duterte’s Philippines, national leaders are winning by promising to “take back control” and (re)assert their national power. Instead of calibrating nuanced and effective solutions, such leaders tend to reject global cooperation and openness altogether, often exacerbating the very problems that brought them to power in the first place. 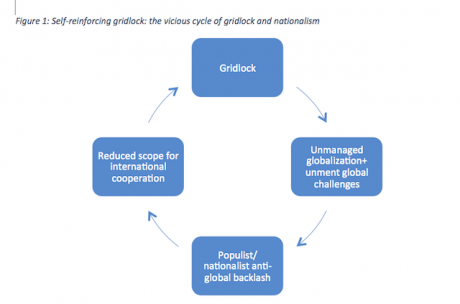 Though this trend has multiple causes and many local variations, we argue these nationalist leaders are not isolated cases, but in part products of a systemic trend we call self-reinforcing gridlock (figure 1). The logic is as follows. Gridlock weakens our ability to manage globalization and deal with global issues, which inflicts real harm on significant segments of the world population. Think of the failure of global financial regulation to stem the 2008-2009 crisis, or the failure to address adequately the current refugee crisis, for example. Exposed to the hard edge of globalization, populations naturally react against it, seeking to reassert national control. This creates the political conditions under which nationalist, populist leaders can succeed. But instead of calibrating nuanced and effective solutions, such leaders tend to reject global cooperation and openness altogether, often exacerbating the very problems that brought them to power in the first place. This rejectionist ideology deepens gridlock and begins the whole cycle anew. While gridlock describes much of world politics today, it is also unsatisfying in two distinct ways. Intellectually, it does not account for a number of exceptions and anomalies, empirical facts that any good social scientific theory must engage with. And normatively, it paints a bleak picture of a world locked by history into a downward spiral. As citizens, we don’t only need to understand gridlock, but to find ways to break it. These twin motivations were the genesis of Beyond Gridlock. 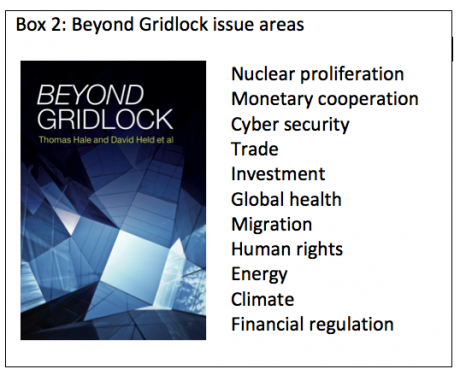 With the help of a dozen leading experts, we began systematically to compare the extent of gridlock – and the exceptions to it – across different areas of world politics (see box 2). We found two things. First, that gridlock is indeed pervasive and persistent. Second, despite gridlock, global governance is more resilient, adaptive, and amenable to agency than the stream of grim headlines suggests. Gridlock may be widespread and structural, but it is not omnipresent or determinative. Looking at how gridlock does, and does not, apply across issue areas reveals seven systematic pathways through and even beyond gridlock (Box 3). These pathways of change describe a constellation of conditions and causal mechanisms that apply across various domains. We can group them into three baskets: resilience, innovation, and agency. First, a number of global institutions are more resilient and adaptive than the gridlock argument suggests. In some areas, international institutions have retained or gained a degree of autonomy (pathway 1) from their member states that allow them to work even under conditions of gridlock. For example, the International Energy Agency retains significant decision-making power on the deployment of strategic fuel reserves. Other institutions have tools at their disposal that can adapt to change, like the World Trade Organization’s Dispute Settlement Mechanism. This quasi-judicial body can develop its own jurisprudence to deal with situations not foreseen in the negotiation of the treaties that created it. Other institutions like the Berne Union or the Intergovernmental Panel on Climate Change operate at a technical level that allows them to focus on problem-solving with some degree of insulation from the gridlock mechanisms (pathway 2). Many of these innovations involve new kinds of actors – like cities, businesses, civil society groups, and others – and new modes of global governance, often reaching into domestic politics. Second, and perhaps most strikingly, we document numerous innovations in global governance, often in direct response to gridlock. Many of these innovations involve new kinds of actors – like cities, businesses, civil society groups, and others – and new modes of global governance, often reaching into domestic politics. For example, the 2016 Paris Agreement on climate change shifted the regime to a “catalytic” model that sets out a global target, and asks countries, and also other actors, to make a progressive series of pledges to meet it. This allows for a plurality of action and actors to work toward a common goal (pathway 3), generating not fragmentation but synergy. New ways of institutionalizing global governance have, moreover, not stopped at the border, but reached inside nation states to mobilize domestic constituencies (pathway 4). For example, in the realm of human rights, international courts and review processes give voice and standing to groups fighting on the ground, sometimes shifting the balance of power within countries toward more cooperative outcomes. Third, we find that agency matters. Gridlock is ultimately a structural theory focused on historical trends, but Beyond Gridlock shows how and where countries, but also other actors, can work around or even against the broader constraints they face. Obviously the actions of great powers can be decisive, and under some conditions gridlock can shift their preferences toward global problem-solving (pathway 5). For example, the 2014 Ebola outbreak in West Africa can be attributed in part to the weakness of the World Health Organization’s monitoring and rapid response facilities. But once the crisis threatened to spill across borders, the United States acted swiftly to contain it, along with other major powers. Non-state actors can also show agency of this kind. During the 1990s, coalitions of civil society groups and reformist states (pathway 6) were able to bring real changes to global governance, such as the global treaty banning landmines, or the creation of the International Criminal Court. More recent movements like Occupy Wall Street or the Arab Spring, fuelled by the digital revolution, have yet to make this “inside-outside” strategy work, but it remains a significant potential lever for change. More recent movements like Occupy Wall Street or the Arab Spring, fuelled by the digital revolution, have yet to make this “inside-outside” strategy work, but it remains a significant potential lever for change. Finally, in several areas, gridlock has produced not just stasis but leadership (pathway 7). After 20 years of deadlock, political entrepreneurs in the climate realm were able to articulate a new vision for the regime, and make the world buy into it. Inspired philanthropy from the Gates Foundation and others has helped to reverse the tide for some of the world’s most deadly diseases. In sum, gridlock is a barrier to progress, but not an insurmountable one. And sometimes it can spur the very actions and innovations needed to unlock it. None of the pathways through and beyond gridlock should be seen as silver bullets. Searching for facile ‘solutions’ to macro-historical trends is quixotic. What Beyond Gridlock offers instead is an analytical and comparative account of the key levers and processes through which change can be built over time. This creates the qualified optimism that while we cannot break gridlock overnight, over time there is important work to be done to build a better world. Hale, T., Held, D. and Young, K. 2013. Gridlock: Why Global Cooperation Is Failing When We Need It Most. Cambridge: Polity Press. Hale, T. and Held, D., et al. 2017. Beyond Gridlock. Cambridge: Polity Press.